Note: This is a retrospective of our participation in the Skillsfuture Hackathon 2018. Some things, like learning, never change even when times do. Just as Confucius said (no, seriously) that “Even from a group of three, I can surely find a teacher”, learning from peers by emulation or asking advice is a key way to gain knowledge. So how do we use digital products to encourage this sort of peer learning? This was the question we chose to tackle as attendees of the Skillsfuture Hackathon 2018 on 19 and 20 May. 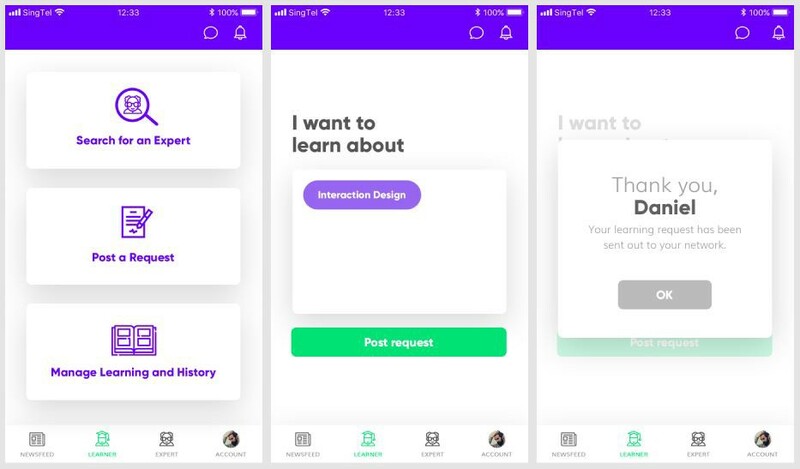 Over two rainy days, our team of five from Reassemble designed a working prototype of an app that can help people improve their peer learning experience. Okay, that wasn’t entirely correct. On the Monday before the hackathon we attended a briefing session where we learned about the different challenges, so we had a little time to do what every UX designer starts with: user research. We know peer learning is a challenge SkillsFuture prioritises. But what do actual people talk about when they talk about peer learning? Our research comprised a total of 13 user interviews where we asked people — mainly working professionals — about their needs for workplace skills. 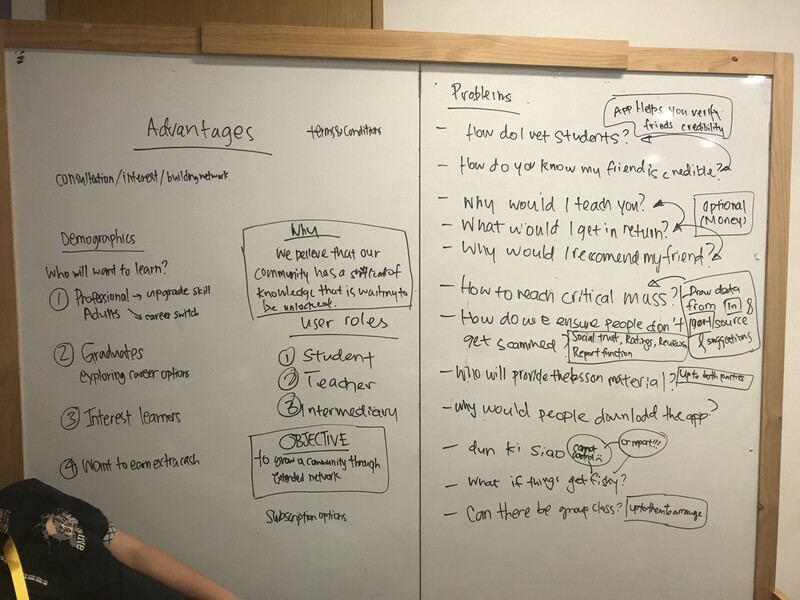 We wanted to find out about their cases of successful and unsuccessful peer learning, and find out what issues determine whether people can learn effectively in a community. Peer learning is definitely important. The time commitment of a classroom course is often too inflexible for people who need to upskill in a hurry. While there are endless resources online for learning, these are often general and don’t fit the specific context of a user’s skill needs. To compound these problems, there’s the problem of trust, where I don’t know if the advice I receive is actually best practice. The first clue to help with our conundrum came from our assigned mentor — Djoann Fal, CEO of Getlinks. He was at first concerned with our lack of coding ability (more on that later), but his subsequent advice and experience provided interesting insights. A model of learning that Djoann advocated was personal and direct — asking someone out for a coffee to exchange knowledge, review work and give pointers. This informal exchange had brought him lots of benefits in his work as a digital marketer, and our own experience as user researchers fit into this framework too. 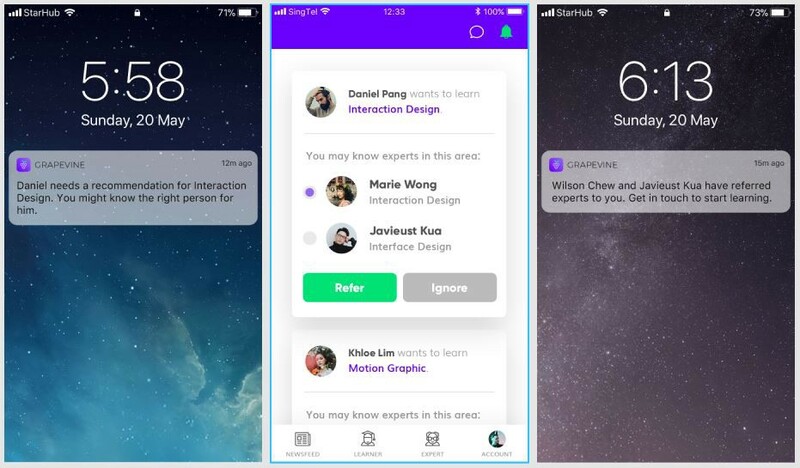 Sometimes the best way to find things out — whether it’s user behaviour or professional skills — is to find someone who knows, and then talk to them. But then that raises another question. How do you find someone like that? Mark Granovetter is a renowned sociologist at Stanford University, and it was his work that provided the other piece of our puzzle. 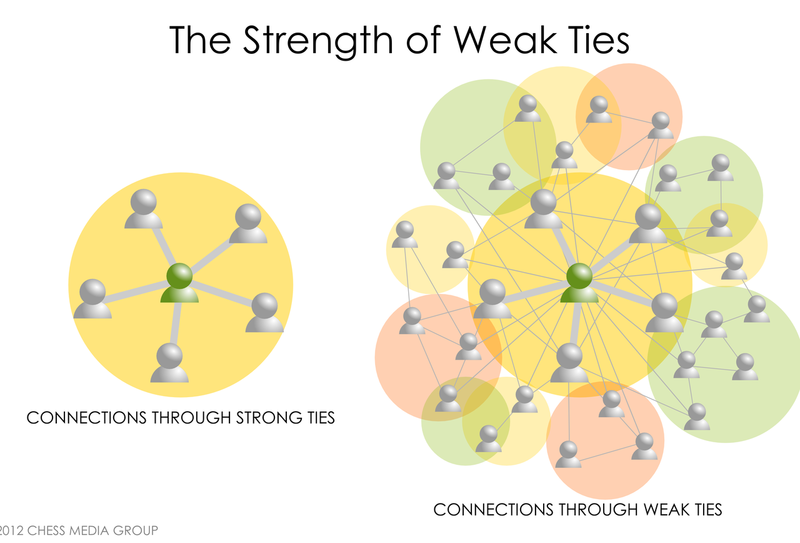 Granovetter’s most famous theory was a counterintuitive idea, called the Strength of Weak Ties. Our close friends, with strong bonds, bring us the most emotional benefits; so it seems intuitive that they also bring us the most intellectual and professional benefits too. But Granovetter’s research showed that this was not quite the case. Rather, it was the weak ties that brought more information, as well as job referrals and other professional contacts. We may laugh most with our buddies, but we often learn more from our acquaintances and friends of friends. Another related idea was that of the Forbidden Triad, referring to the network of our friends-of-friends. If A is a good friend of both B and C, the theory goes, it is almost inevitable that B and C will end up knowing each other. The weak tie between B and C then becomes a conduit for information. If learning through friends of friends is a key feature of society, why not design a digital product to make it systematic and skill-specific? These two ideas, put together with our pre-research, helped us to refine and complete our product, which we called Grapevine. For professional skills, learning from a subject matter expert over coffee is a brilliant idea. It doesn’t require the time commitment of a whole course; the expert can customise their advice based on circumstances. And of course, the whole thing can be arranged ad hoc, as and when some advice or mentoring is needed. Time. When time is of the essence, you need to find an expert quickly. This means casting the net as wide as possible. Trust. For workplace skills, the advice can enhance — or damage — your work. This means you will need trusted advice — you wouldn’t just ask some stranger you find on Google. Because Grapevine uses your second-degree connections, the so called weak links, it gives you access to a far bigger pool of expertise. This helps to solve the Time problem. But because this expertise is recommended to you via your trusted friends and associates, you can be a lot more confident that their advice will actually help you. Therefore, by using social trust, we help to solve the Trust issue too. There are three main user roles in Grapevine: Learner, Expert, and Intermediary. At any time, a person might take on any of these roles, participating in a skill exchange. As it turns out, one of Daniel’s friends is Wilson, and Wilson happens to know Marie — a professional interaction designer at an agency. 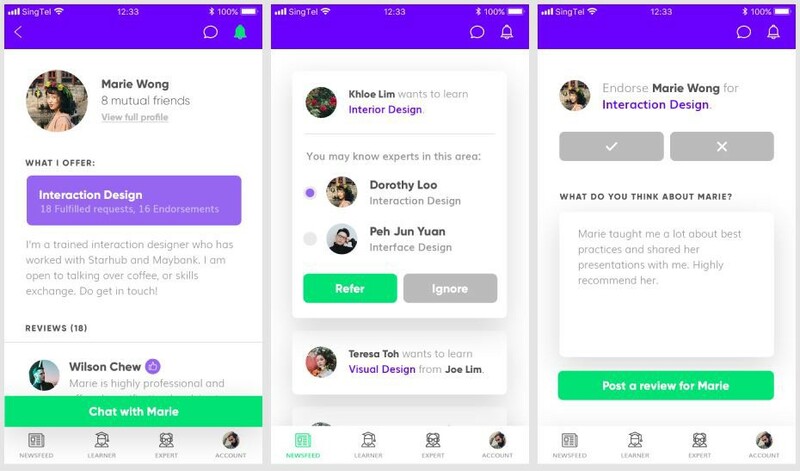 As it can keep tabs of a person’s skill profile, Grapevine can recommend suitable experts with relevant skills, making it easy to recommend someone. Wilson just has to click twice to connect Marie with Daniel. Once connected, Daniel can look at Marie’s profile, to verify that she is suitable. After that, the two can exchange messages and arrange a coffee meetup, where Marie helps Daniel with some industry specific advice on interaction design. Highly impressed by this, Daniel leaves an endorsement and glowing review of Marie’s abilities. For Daniel the Learner, the benefits are both direct and indirect. On one hand, he gains a quick boost in skills that allows him to do his job better. At the same time, he is now Marie’s friend — so through her, he can gain access to even more experts in relevant fields. Maybe next time he will need a content strategist, and chances are that Marie, as an industry veteran, will know a strategist she can recommend. Marie the Expert gains from this too. Free coffee is nice — but even better is the recognition and endorsement that comes from spreading her expertise. As she gathers endorsements and reviews, Marie now has social proof that she’s an expert in Interaction Design. What do people — actual people, doing actual jobs — really need to learn? Where are the skill gaps, where lots of learners are chasing few experts? How are people going about their peer learning — over coffee, in groups, through events? Answering these questions can help build a workforce that is a lot more adaptive, while ensuring that policy is responsive to needs on the ground. Our next project could be your product. Find out more about us at our website, and get in touch through LinkedIn or Facebook.